Included below is a letter from Delend Cuddihy of the Yungaba Action Group. In these days leading up to December 15, the date set down for the hand-over of Yungaba to the developer, it seems appropriate that this act of despoliation will happen in the season of Scythrops novaehollandiae. 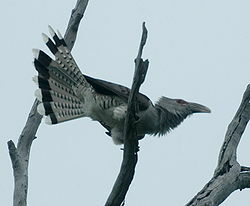 The largest parasitic Cuckoo in the world, Scythrops novaehollandiae, migrates to Queensland from overseas between August and October each year. This fearsome bird, with its raucus cry -- listen to the audio file (191K) here. -- strikes fear into the hearts of local birds as it seeks out nests, destroys eggs or eats the young, and then lays its own eggs in the nest. The youngScythrops chicks don't evict the host's young or eggs from the nest, but they simply grow faster and demand all the food, thus starving the others. Then, through deception and gluttony, they grow to full, awesome size and depart Australia. Just so, the reign of the Scythrops novaehollandiaedevelopers and profiteers has descended on Queensland - with the sale and redevelopment of Yungaba, the 30 story highrise developments in West End, the sale of public forests, ports, motorways and parts of the rail network and, now the announcement late last week that the State's National Parks are to be opened for eco-tourism development. See the Courier Mail story "Parks Tourist Storm Looms" of 25 Nov 09. To paraphrase Tony Fitzgerald's recent warning, Scythrops novaehollandiaeare already in the nest of Queensland! Queenslanders have but a short time for our voice to be heard, to raise our own storm in protest at this despoliation. Demonstration on the grass on the river side of Yungaba at 10am -- 12.30pm Sunday, 13 December 13. Can you help us spread the word of this demonstration? -- see poster attached (pdf 168KB). Perhaps you could spread the poster to your friends, family, through your networks, facebook etc? or print copies of it and paste them around your neighbourhood? Or perhaps you could ring the Government Call Centre on 131304 to have your comment recorded and reported. Whatever we can, wherever we are, with whatever we have, we must act now to protect our heritage and culture. Dear Yungaba Supporters & Friends - Remember the Belle Vue & Cloudland? The bulldozers are already on the Yungaba site. On December 15, the State Government finalized the sale - Yungaba now belongs to Australand. When I attended Yungaba for a television interview on December 15th, the television crew was not allowed to film the interview in front of the building. So much for the much vaunted claim that this development will retain the heritage of Yungaba and benefit the community! The alienation has started already! - see Courier Mail article "Yungaba sale settles but action group fights on" of 15 Dec 09 by Margaret Wenham. As regards 1. - unsurprisingly, the silence to our request is deafening. In the meantime, Yungaba's cause has gained the support of many prominent Queenslanders and Australians. With the aid of these people, we are appealing directly to Australand to save Yungaba for the people. Australand have advised us that it will cost them $13 million to refurbish Yungaba, plus $5.3m to build an Auditorium in the Yungaba Carpark. Surely they will be interested in saving $19m for their shareholders, as well as saving Yungaba for the people of Queensland? Therefore, as regards 2. - if you are interested in the formation of a community fund - please contact me. We have written again to the Lord Mayor suggesting that he can now deal directly with Australand to secure Yungaba for his Multicultural and Indigenous Museum. So could you contact him again on lordmayor [ AT ] brisbane.qld.gov.au to let him know that there is widespread community support for this? Many people continue to sign the petition on our website and to tell their Yungaba story. These stories and petitions are invaluable - as they are the bedrock that reassure us that Yungaba is a just cause and worth fighting for - and add strength and momentum to our cause. We are becoming a generic country as a place to store people. Developer-driven population growth leaves no room to respect and remember our history, culture, early Australian architecture or the story of our pioneers. Our identity as Australian is being fragmented and destroyed for mass immigration and $$$. We are a plastic society with plastic people who care nothing for historic values or tradition or of intrinsic worth of our what was a wonderful country. Australians need to start debating what it means to be Australian, what values we treasure, and which aspects of our way of life we are prepared to compromise and which ones we are not. Then we need to look at what is happening to those values and way of life and start addressing their erosion. If we don't and just sit back, 'she won't be right'. Those values will have eroded and have become relegated to history, under our watch. When 383,000 from overseas are rocking up every year, their sheer numbers unchecked will inevitably reshape Australia. What is Immigration Policy accountable for? Government immigration policy needs to be held accountable to immigrants and to the consequential impacts that immigration brings to Australia and to Australians. It has become clear that it is unacceptable to all parties that immigration policy stops at the International Arrivals Gate, that it ignores the special needs of immigrants, ignores integration and assimilation, ignores the costs to accommodate this direct increase in demand, ignores the consequential costs on Australia. Assimilation takes time and generations. Public and private infrastructure and resources are proportionally consumed for every additional person added to Australia (be it by birth or immigration) - housing, roads, schools, public transport, hospitals, childcare, fuel, groceries, and every human consumption need and want. Marginal planning for immigration that stops at the International Arrivals Gates and hand balls the triple bottom line problems to under-resourced State government budgets is irresponsible. It is no different to allowing cheap import dumping into Australian markets and sending local industry broke. This is not an argument for protectionism. It is an argument about the lack of accountability of Australia's current immigration policy for the economic, social and environmental consequences it is causing. Immigrants deserve protecting and nurturing more than most and it takes decades to assimilate. Look how long it took the Greeks and Italians post-WWII to assimilate. My estimate it took two generations and it wasn't until the 1970s until the Australia-Italian mixed culture was embraced by the mainstream, even then there must have been a lot of trauma in the intergenerational acculturation process. Are we really 'sorry' for marginalising some of Australia's society? What is appalling is the continued marginalisation of Australia's traditional people from the mix. If Australia's way of life and values embraced aspects of that of Aboriginal peoples, like in some way the Maori in New Zealand have shaped Kiwi culture - (look at the All Blacks Haka), then as a society Australia may not have as much need now to reverse its environmental damage. Mass immigration is indeed the elephant in the room. For Rudd to ignore this, the dominant driver of consumption, and to spend time on trading green house gas emissions is to negligently navel gaze as if pre-occupied in Sudoku one of the Titanic deck chairs. 'Rudd-gazing' has become the greatest eroder of Australian way of life.